We actually had a couple days to explore, visit, and catch up on some office work before leaving Q. 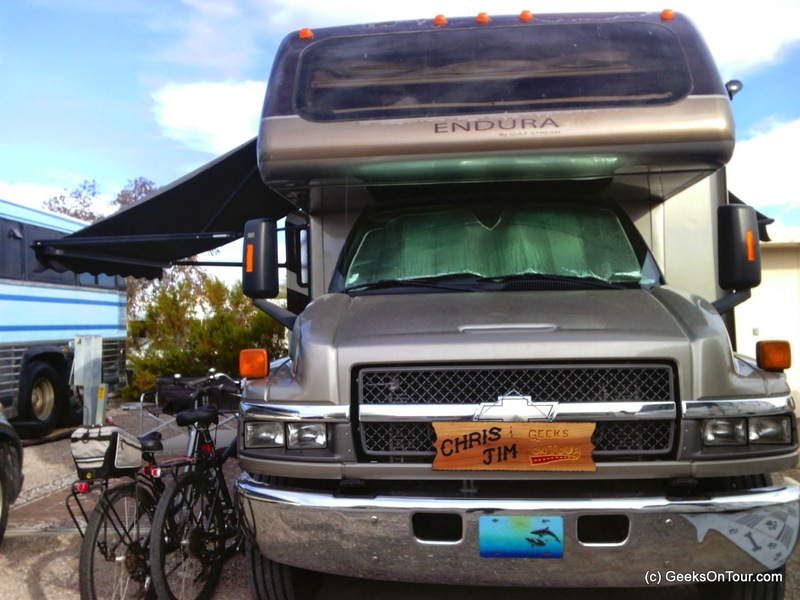 We moved from the RV park where we gave our Geek Week, to a private lot where Butch and Fonda Williams were parked. They told us there was one space available, if we could squeeze in. You can't really see it in this picture ... the tight spot was on the other side, we had to get another RV to move back a couple feet before we could fit. With only one day to go of our Quartzsite stay, we just had to go and climb "our" hill. The one that we hiked to most every day when we stayed there back in 2004-5. I grabbed this picture from Jim's facebook page, cuz it's cool to see the comments too. And, here's a screenshot from my phone. 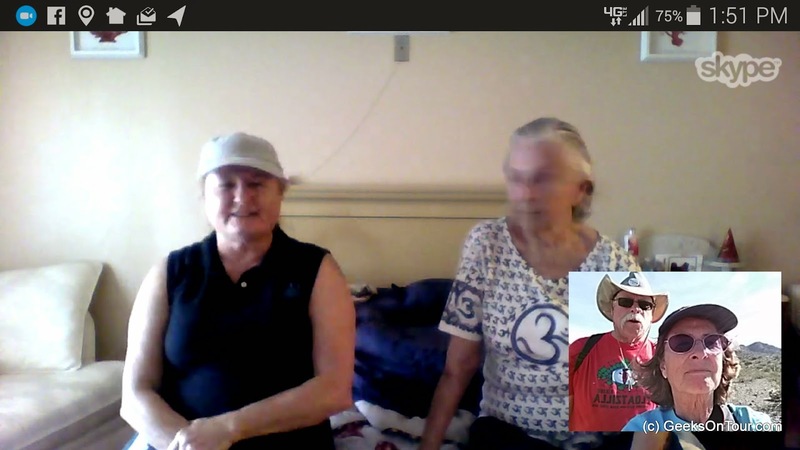 You can see that I'm using Skype and seeing Mom and Dee in Florida, how they're seeing me is in the corner. What a great way to communicate. Notice the comment from Bill Osborne about Flying today? That prompted our next visit. Bill and Kris were parked out in the desert, with the Boomerville folks from Escapees. He also has a quadcopter and he and Jim have been wanting to get together. Of course, we really came to visit with Winston - Bill and Kris's dog! 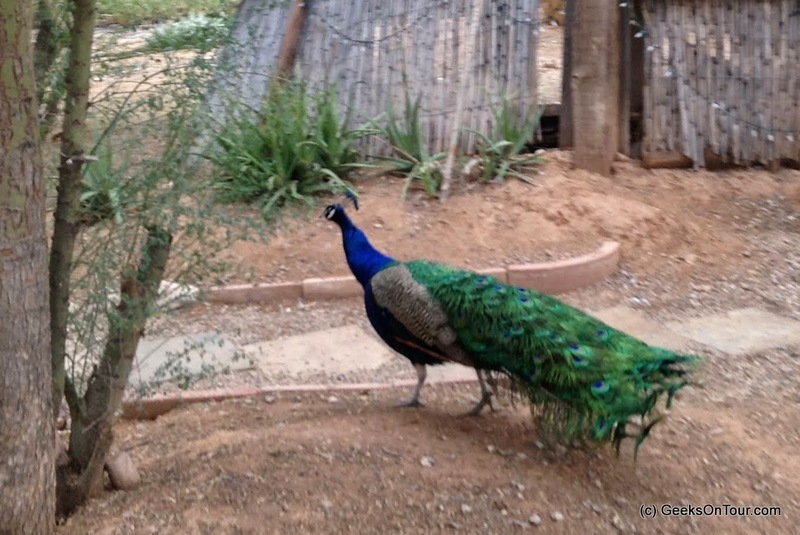 I just love this little animated .gif that Google+ photos made with the Auto-Awesome feature. We also got to visit with another friend in the desert. Don Bradner, and his Bluebird group have been meeting here for 12 or 13 years! See Jim's video in the previous post. So, that's it for Quartzsite. We did one more What Does This Button Do? show, and then we hit the road. After our Sunday What Does This Button Do? Show, we like to do something fun and special. 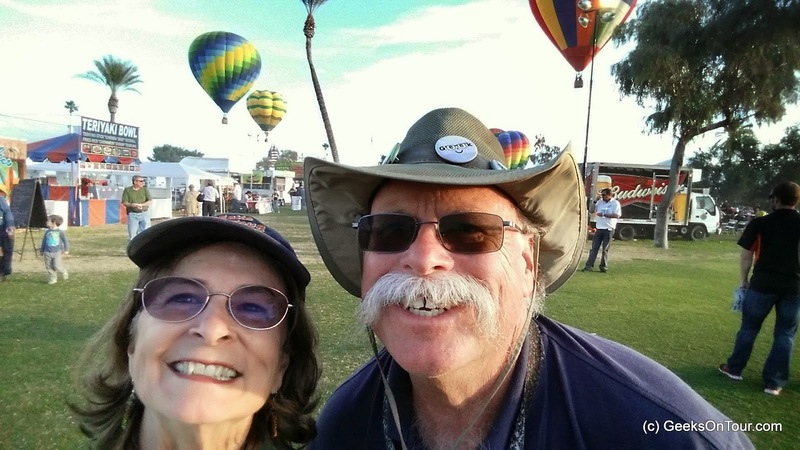 Thanks to an email from a Geeks on Tour member, Fred Sowerby, we knew about this Balloon Festival just up the road in Lake Havasu city. It was a beautiful day, so we turned off our computers and got in the car. I'm so glad we did! 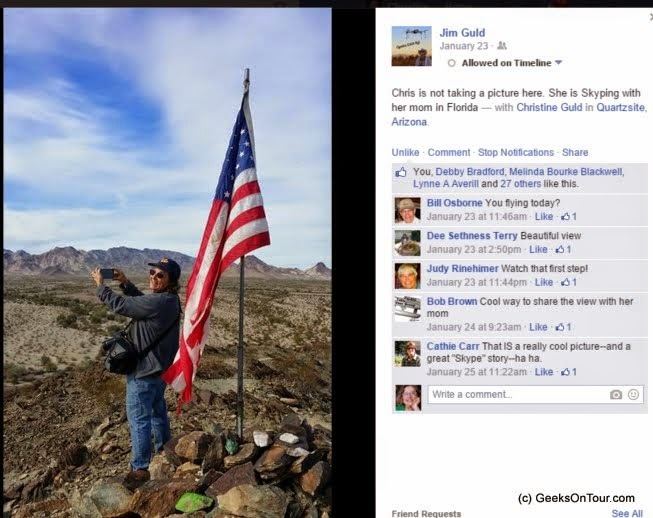 We saw LOTS of VW buses headed towards Quartzsite - they must be having some kind of rally. Felt like we were being transported back to the 60s! 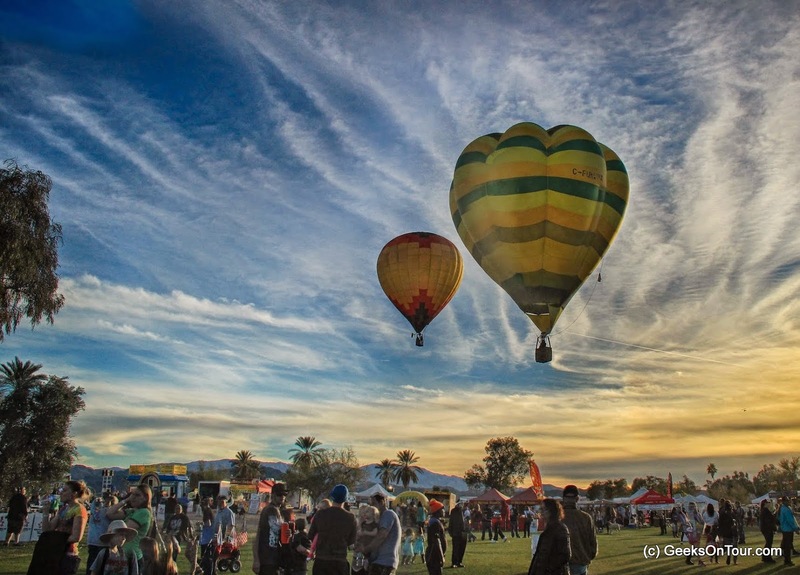 This is a cool picture that Google+ Photos "Auto-Awesome" feature put together for me. I took 4 or 5 original photos and it created this animated GIF. The Desert Experience ... not solitude! Jim's been having a lot of fun with taking video with his new Quadcopter. Here's a video of the Escapees happy hour where hundreds of people are camped all around, many of them boondocking in the desert and here is where we got together for happy hour. 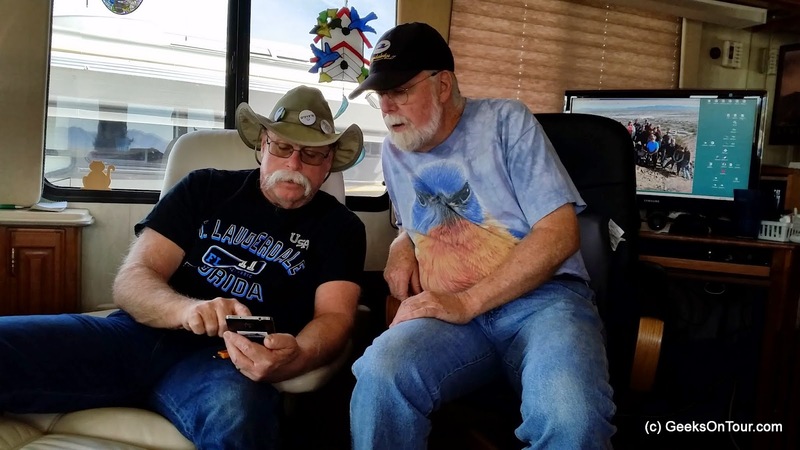 And, here is one he did when we visited our friends Don Bradner and Joy Langle who are part of the Bluebird bus group. 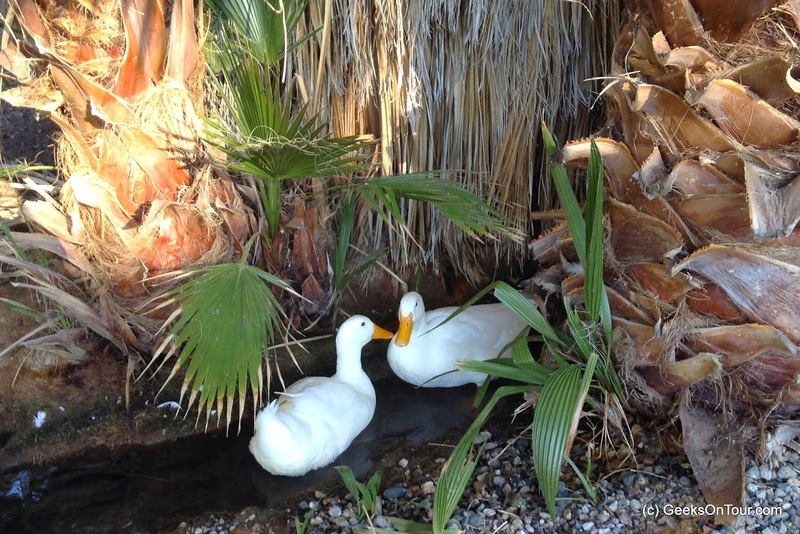 They've been meeting here in the desert every year for over a dozen years. Can you say, "Pull the wagons into a circle?" Not us. We're parked where we have full hookups. Quartzsite is in the middle of nowhere in the Arizona desert. With a year round population of around 3,500, it swells to over 250,000 in the winter months when all the RVs show up. 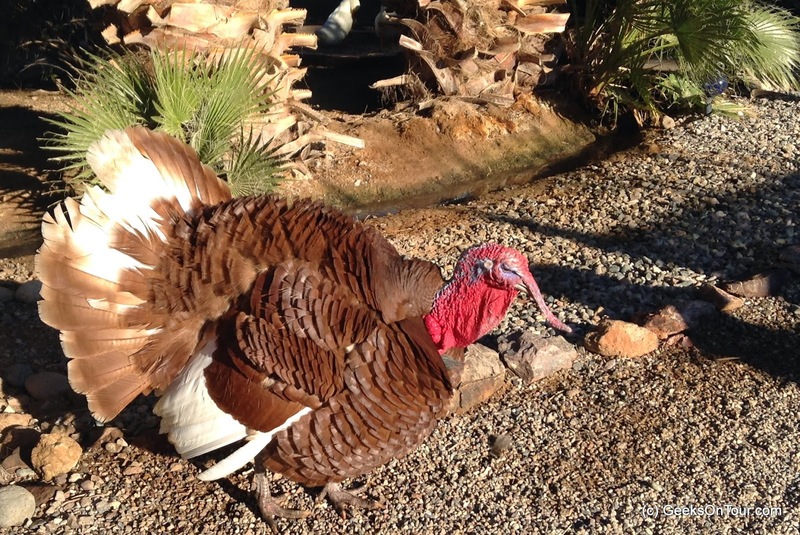 We made arrangements a ways back to do a week of classes at The Scenic Road RV park in Quartzsite. We really enjoyed doing that. The park management did a great job of promoting the seminars and keeping track of who was coming. We had good groups every day, and most of them came to all the classes. We especially like teaching the hands-on 'Learn by Doing.' classes. 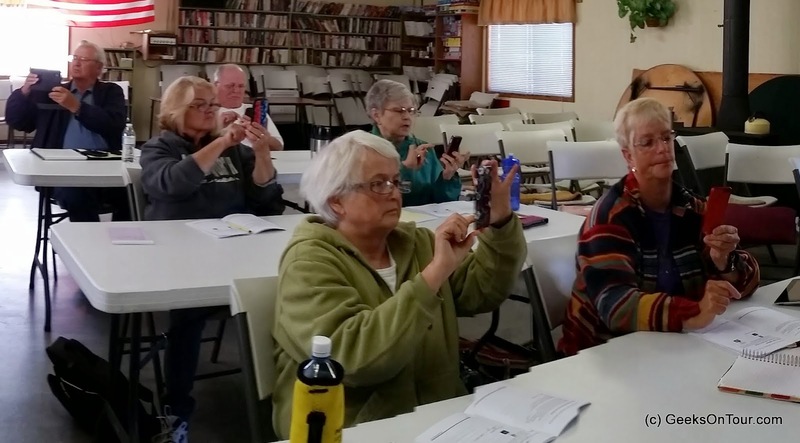 Here we are making people use the different features of their smartphone and tablet cameras. To see more details of the classes we taught, here's the page for Geek Week on our website. 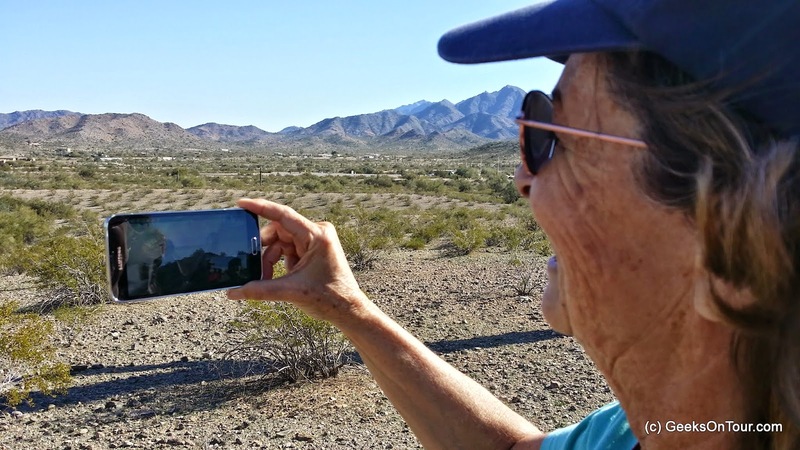 We're so happy that we knew about the hiking club while staying for the month of December at Palm Creek in Casa Grande. We joined the club on a hike every Friday in December. 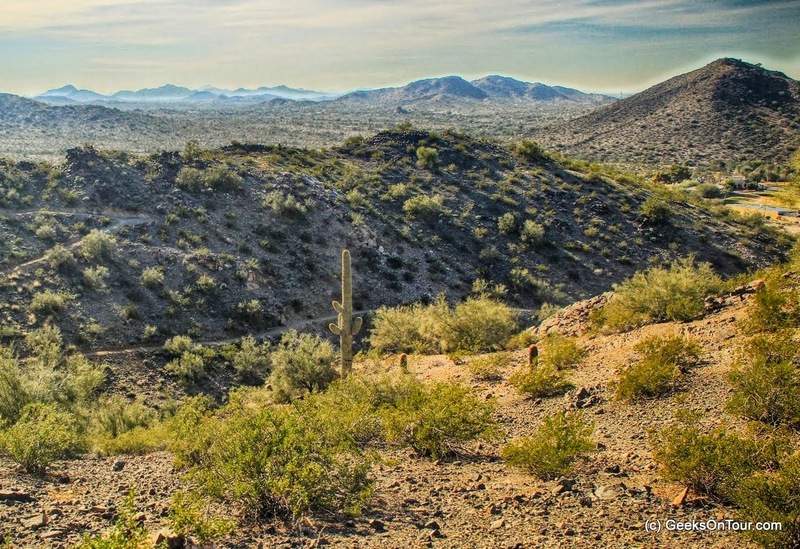 I think that was our inspiration for finding a place to hike while we're staying at Leaf Verde near Phoenix. 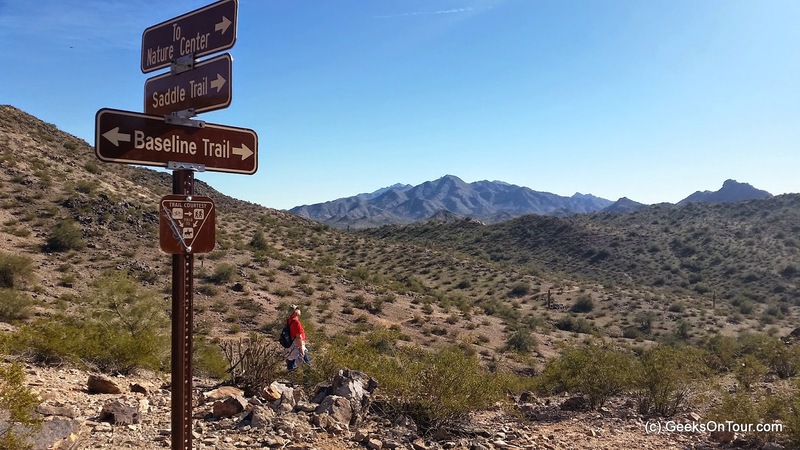 There are several Regional Parks in the mountains nearby and we picked Estrella Regional Park for a hike yesterday. It started out a little chilly but warmed up as we walked. 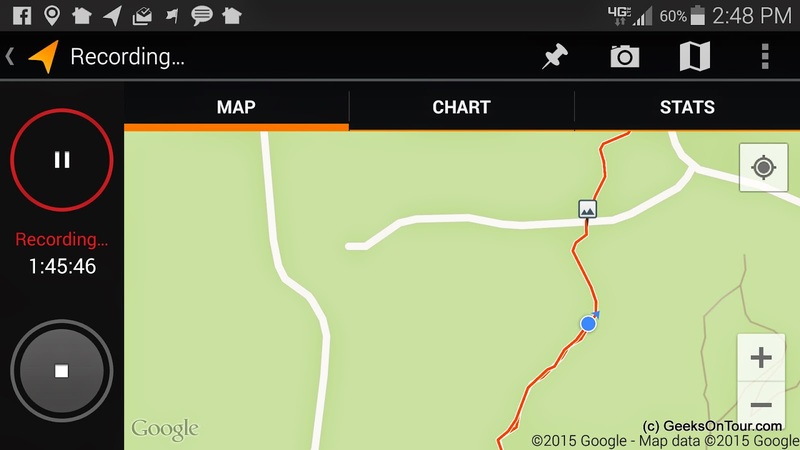 About 2/3 thru the hike, my phone rang with the Skype alert sound. 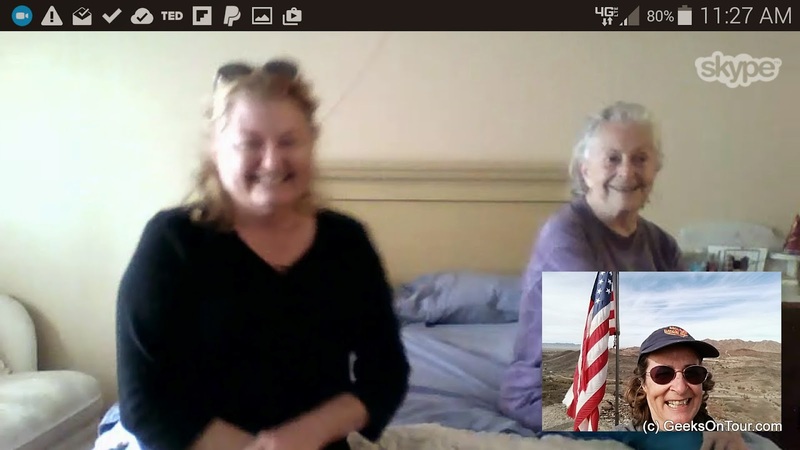 How cool is this to be able to share the sights and sounds of Arizona with my Mom, and friend Dee, in Florida?! That was a beautiful day enjoying the Arizona wilderness area. Then we did a little shopping at Trader Joe's and enjoyed a steak dinner at Outback. NICE day. The next day we spent on our computers - a day at the office. But, before dark, Jim had to go try out his Quadcopter in the desert. He had made a few minor repairs after his crash last week and needed to see if all was well. There is a nice open area of desert right across the street from this RV park. It only took us 25 tries, but we produced a show we’re proud of this Sunday. We’ve been slogging thru the unknown jungle of Google+ Hangouts On Air to accomplish this. 25 times, we’ve set up computers, tablets, cameras, and microphones. We’ve used the Google+ tools to broadcast LIVE over the Internet to anyone who wants to watch. Like a moth to the flame, we are drawn to this technology. I love the opportunity to teach, and Jim loves making the technology work. We’re a really good team for this. Several factors combined to make a good show yesterday. We’ve used the same configuration of equipment for several shows now, so we’re getting comfortable. We had a topic I really like (photos) and, most important, we had a great Internet connection. Bandwidth is KING. We could deliver the most excellent show, but if we have poor Internet, it looks like crap. 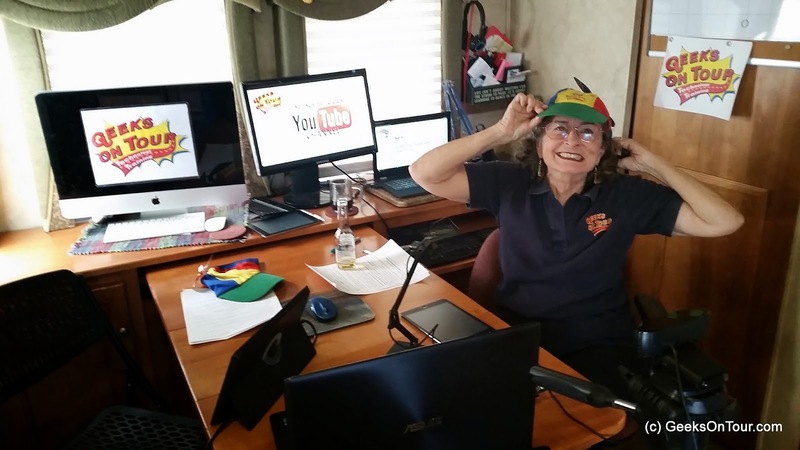 We wear our propeller beanies just to remind us not to take ourselves too seriously! Go ahead and click the picture below or go to our Youtube channel Youtube.com/2geeksontour and watch What Does This Button Do? Episode 25: Photo Organization. It’s 45 minutes total and we cover a tip on spare batteries for smartphones and tablets. We cover how pictures are organized automatically on iPads as well as Android devices, and we cover Google Translate as our App of the week. We also had several people watching live, and they asked some good questions. We’ve tried several different ‘layouts.’ Sometimes Jim is at his desk and I’m at mine, other times we’ve sat together side-by-side. We seem to like sitting together but across a table from each other. That has been our configuration for the last several weeks. We’ve also ‘downsized’ with the equipment. One camera that shows both of us, and one computer set to screenshare that is attached to a document camera for showing the phones and tablets. Jim uses his computer to run the show and he can switch the view just by tapping the screen on the camera view or the screenshow view. And, we do all this from our motorhome dining table! The most problematic area has been sound and microphones. Jim finally convinced me that he needed a mixer, so this is the latest addition to our studio equipment. But, even that doesn’t help when we want to have some sound coming from the computer – like playing a video. Jim spent hours, no … days, trying to get that to work without producing earsplitting feedback. He came to the conclusion that it is impossible. Don’t worry – we’ll keep trying to do the impossible! The other area we are still working to improve is the display of devices. In this show, we used a document camera. After a bit of adjustment, it looks really good – except – motion is blurry. So, when I tap a button and the screen changes, it blurs until the screen is set again. And, when I move my hand it’s blurry. The other technique we’ve used is to have a tablet as a participant in the Hangout, then we can use the rear camera of the tablet to show the other devices. That looks pretty good, (here’s a sample) but it’s awkward to use, and it takes up more bandwidth. So, we’re still looking for more options on that front. We’ll check in again after 25 more episodes and see how we’re doing! Just when we’re getting the hang of this, we decide to go and try something more! We are such gluttons for punishment. We put out a call for anyone who wanted to join us in a “Study Group” for learning more about organizing pictures across mobile devices. With those people we are going to use the Google+ Hangout tools to have private video calls. Up to 10 people can be participants in the video call, talking, asking questions, showing their screens etc and the rest of the group can watch and leave comments. We had 63 people respond and we have now closed the group. 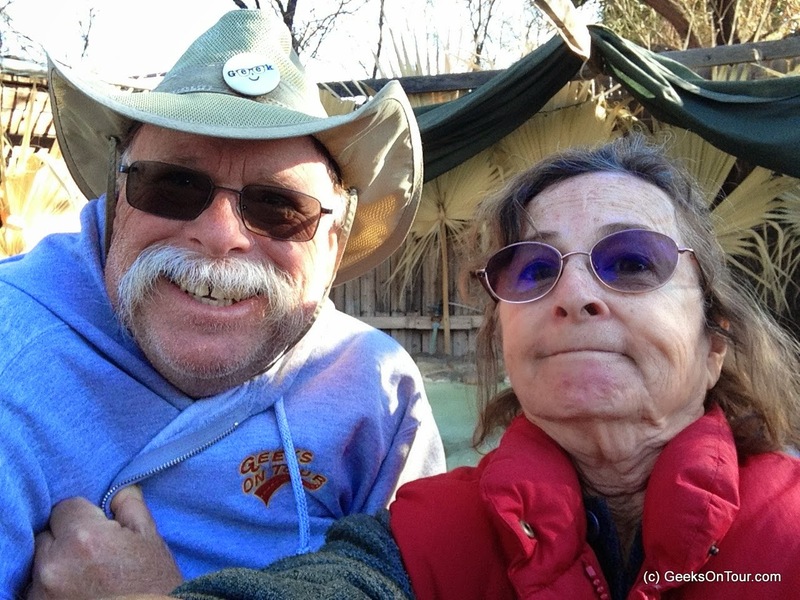 We were supposed to leave Palm Creek in Casa Grande on Dec 31, but the day dawned windy, rainy, and freezing cold so we made arrangements to stay another night. That suited me fine since I had to get our newsletter done. Our monthly Geeks on Tour newsletter has turned out to be a month in review piece, so my deadline is the last day of the month. Here is the December 2014 newsletter. By New Year's Day, the weather had cleared - there was no wind, and we were ready to go. One month in one parking place is a long time for us! It felt great to be on the road again. 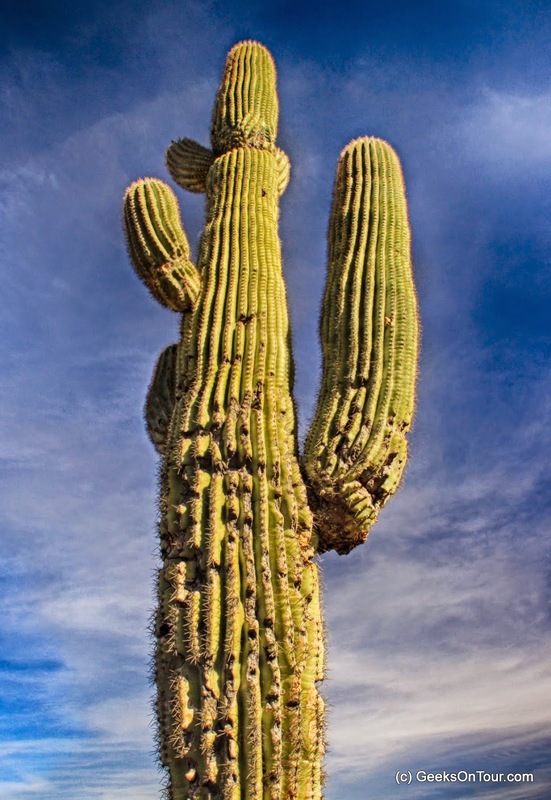 Arizona scenery is so interesting with the Saguaro cactus, the flat land and the abrupt mountains. 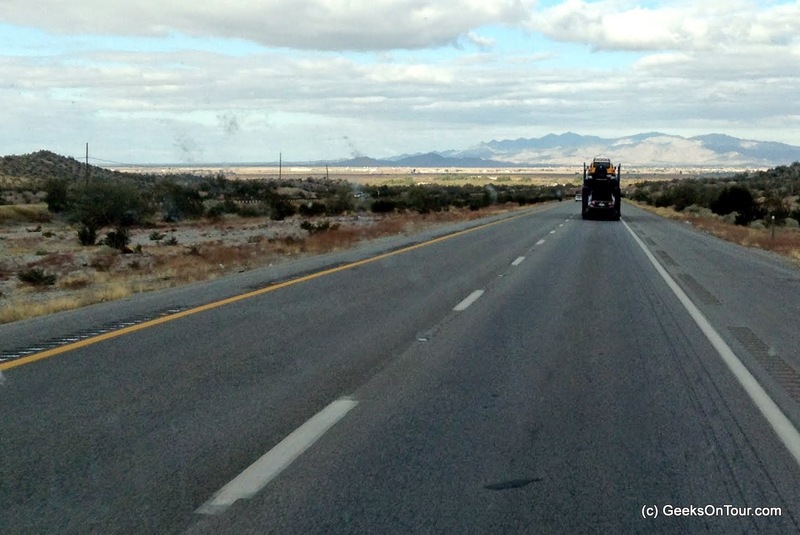 We didn't plan to go very far, we were headed to Quartzsite, but we didn't need to be there for another 10 days. 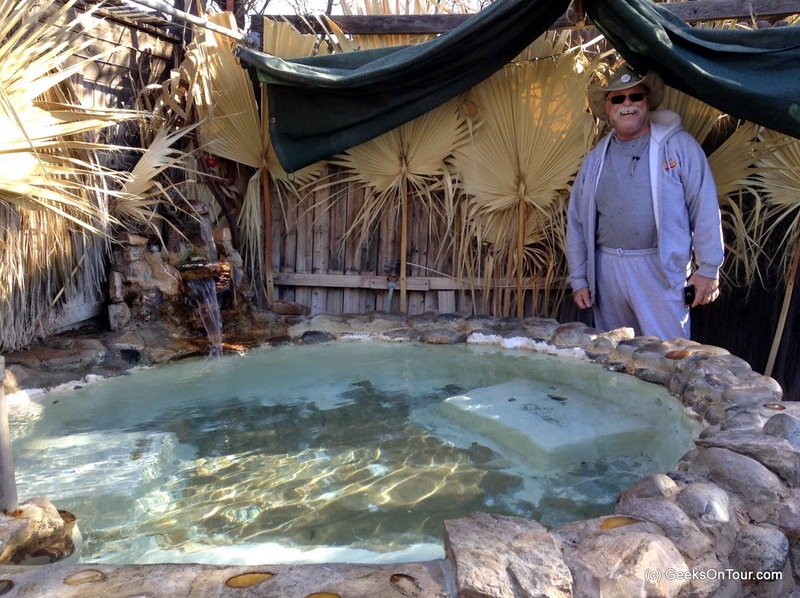 Our favorite hot springs, El Dorado hot springs was just about half way - sounds great! When we woke up the next morning, there was ice on the ground! What?! Weather reports said there was snow in Havasu City ... the first time ever recorded! And we're about to go outside and take our clothes off??!! Man! 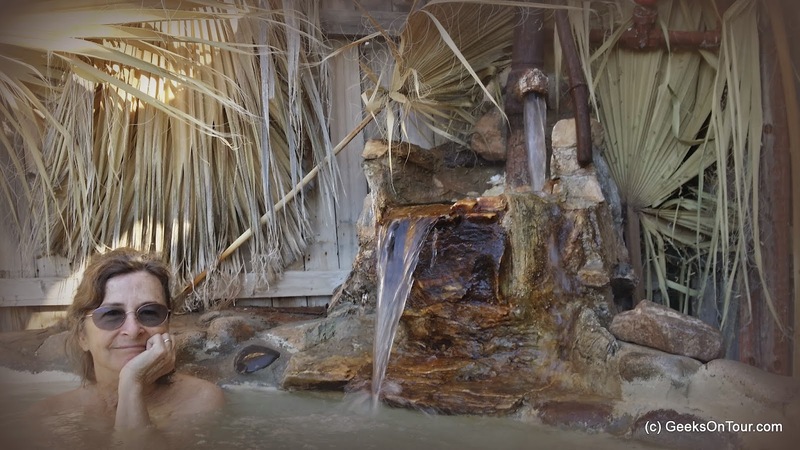 What we'll do for a good soak in hot springs! 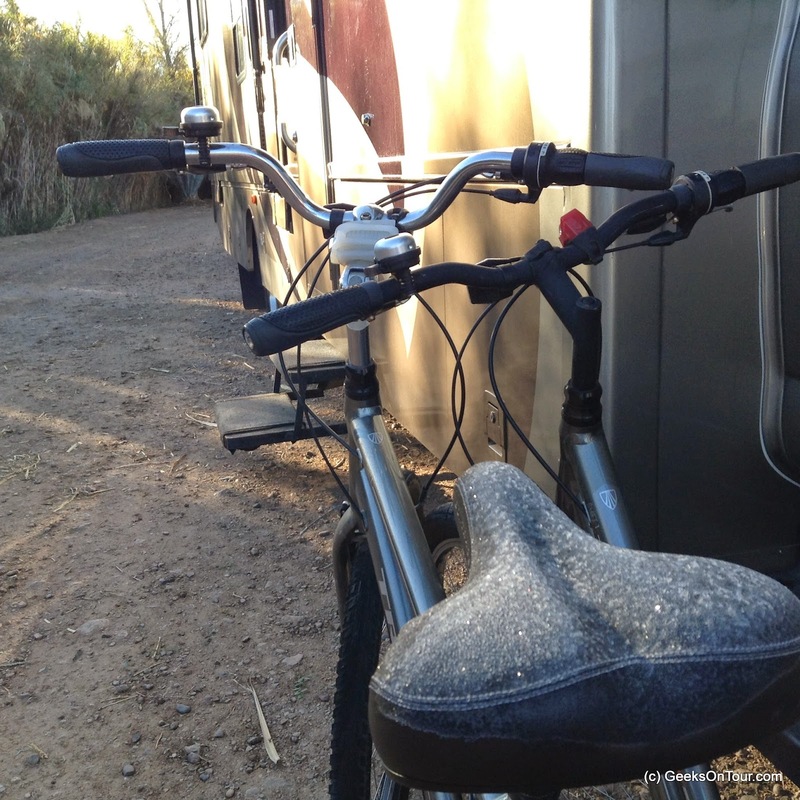 That's frost on the bicycle seat! We've been here before, even as recent as 3 months ago, and I thought I recalled there being good Verizon signal here. Boy was I wrong. Only 2 bars of 3G. We could barely check email, let alone get any real work done. So, we had to leave. We're only 35 miles west of Phoenix, so we figured we'd drive that way until we hit the outskirts of civilization. There's bound to be good Verizon signal a bit closer to the city. The prettiest sight for Geeks' eyes - a nearby cell tower. 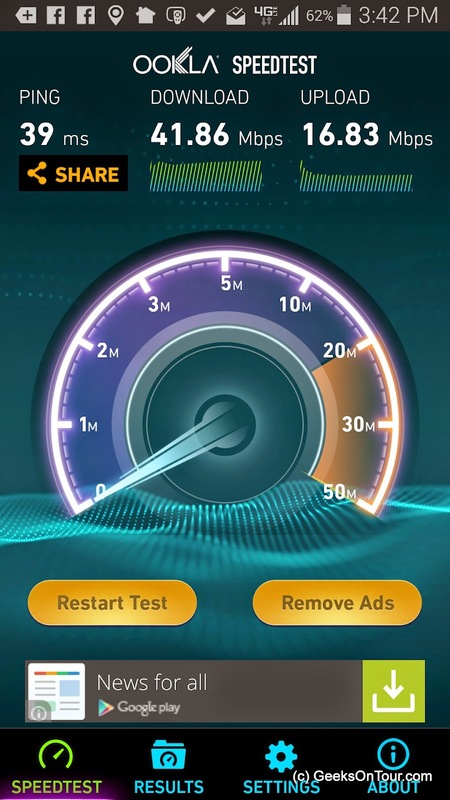 We get 5 bars of 4G XLTE here! 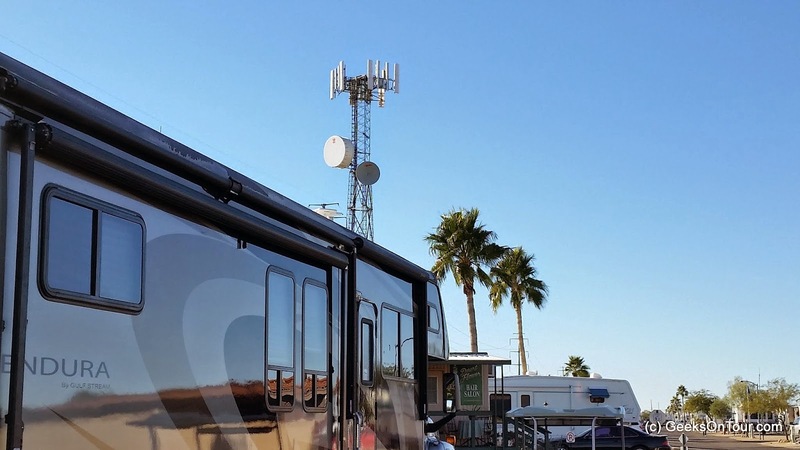 While we were checking in, we exclaimed over the great Verizon signal provided by the tower right IN the park! Five Bars! and someone told a story of a customer who overheard a conversation about there being Five Bars at this RV park and wondered if that meant that all the local drunks congregated here. They'd never heard of an RV park having even one Bar, let alone 5! We'll definitely stay here thru Sunday because we do our weekly show live over the Internet on Sundays. We might even stay thru next Sunday to be sure we can get two good shows done! 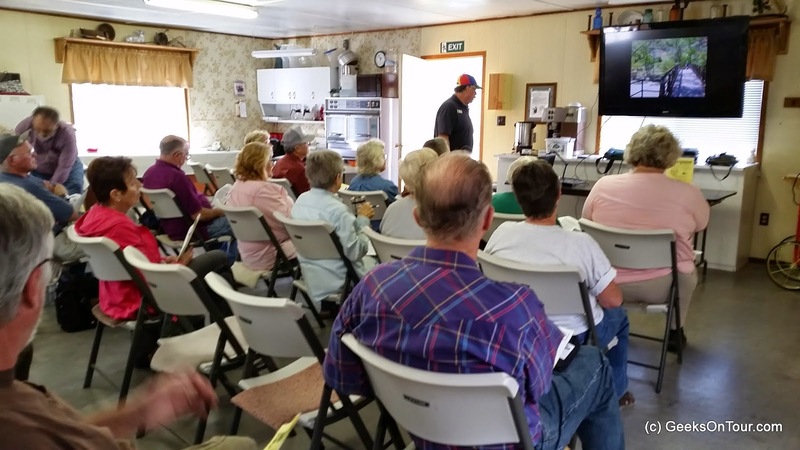 We start our seminars in Quartzsite next Monday.